Dehumidifier Guides - What Size? 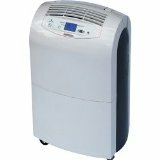 Buying the correct size of dehumidifier for your home or office is important. Too large and you will not have bought the most cost effective model, too small and it may not remove enough moisture from the air. Our simple guide will help you select the correct size dehumidifier. Damp can have a nasty effect on clothes stored in wardrobes and other items such as books. For small areas such as these a small rechargeable dehumidifier is the most cost effective solution. There are currently some good deals available from Amazon, with the Rechargeable Mini Dehumidifier 2Pack currently available at a keen price. For this sort of light use a very small rechargeable or salt based dehumidifier is suitable. For small rooms or if you only need to remove a small amount of moisture a compact dehumidifier or midi-dehumidifier will do the job. If you are planning to use one in a garage or shed then look for a unit that has an anti frost setting. Units that extract anywhere between 250ml and 10 litres over a 24 hour period will be suitable. If you are on a tight budget then the Zennox Compact Dehumidifier Is available at a keen price but has a fairly low extraction rate. If you want to add some style and a more powerful 2.9 litre extraction rate then the Honeywell 2.9-Litre Dehumidifier has a modern look and some great features. If you want to remove moisture from your whole house or if you have excessive amounts of moisture (after a flood for example) then you will need a larger more powerfull unit capable of extracting anywhere between 10 and 30 litres over 24 hours. If you want to dehumidify your whole house then place the unit in a position where the air will be able to circulate throughout the entire house, in a hallway or landing are good locations. An example product available from Amzon is the Igenix Portable Dehumidifier boasts a 20litre extraction rate and electronic LCD display.